It will be the story about how and when the BBproject starts. 4-meter boulder I was passing by every day on my way to the university is only a static element of the landscape. So that’s why, exactly on that university campus, there stands a father of all Beijing boulders. and touching” before I decided to come over with climbing shoes and a chalk bag. The first attempt was made on December 6, 2007 right after the sunset. 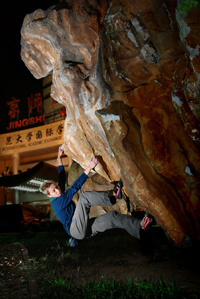 This night is the official date when the BeijingBoulders project started and also the date of the first ascent of the Padre boulder. project on my agenda for this year and what’s there, simply has to be done. For the time being there is 14 described boulders. On my map I have ten more and they will be described here soon. In my head there is over twenty more of them. In Beijing several hundred. Some of them are very hard to reach, like that in front of the People’s Court, but getting to such places is just a part of the game. The game you’re invited to join!